Embarking on a project to add space to your home can be fun but overwhelming at the same time. What questions do you need to ask yourself? What do you need to consider to help you get the best value for your investment? This article will address just that. First, you need to determine how you plan on using your room. Most people initially think of sunrooms as a place to get away from bugs and inclement weather. But there are so many other possible ways to use your new living space. Some options include entertaining, or for use as a home office, spa, or exercise room. Often, customers who plan ahead find that their new sunroom becomes the most used room in their home. The next step is to select the type of sunroom you want. If you decided on how you plan to use your room, this should help you make this decision. If you simply want an outdoor retreat during nice weather, a screened in porch or seasonal room might be the right fit for you. For a bit more, you can upgrade to a glass and screen enclosure that will extend the sunroom's use from early spring to late fall. If you are looking for an expanded family room, dining area or exercise room to use year round, an insulated sunroom or solarium is what you will need. Today's higher quality sunrooms can be purchased with insulated glass and feature thermally efficient framing so they can accomodate nearly any use. For maximum efficiency, energy savings and privacy, many experts recommend separating the sunroom from the rest of the home through the use of a door. You will also need to consider the room's view. Full length glass gives homeowners the best view of the outdoors. You should also consider your climate. If it is sunny most of the year, you may need sunroom blinds, tinted glass and/or air conditioning to control the temperature in your sunroom. If you plan on using your room in the winter and during severe weather, you may need to heat the room and also include insulated glass. The next consideration is the size of the space that you want and will need for how you plan to use your room. Going into other rooms in your house and taking their measures can be helpful in serving as reference points. This will help you get a better idea of the space that you will need. 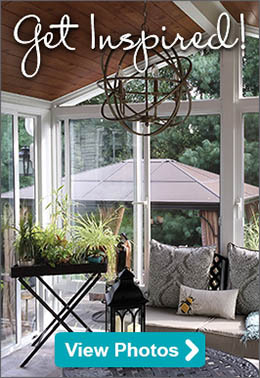 If you are unsure or have questions about planning your sunroom space, we can help! Our design consultants are product experts and can help you determine the best type of room and options to meet your needs and lifestyle. Room additions are usually made of wood, masonry or another solid material and can be costly to build. Most of the area of a sunroom is covered by screen or glass and is likely constructed using a low maintenance wood, aluminum or vinyl frame. The style of the sunroom or solarium you build is only limited by your imagination and budget. Sunrooms are usually a less intensive and less expensive project than a traditional room addition. Generally, sunrooms and solariums can be divided into two basic categories- three season sunrooms and all season sunrooms. How you plan to use your sunroom and available budget will guide which type of room you choose. Three season rooms usually are constructed with single glazed glass and screens. Some companies offer optional tinted glass and shading systems to reduce glare and the effects of the sun's ultravoilet radiation. Single pane glass can shield occupants from wind and offers some protection from moderately warm or cool temperatures but offer very little protection against extreme temperatures. 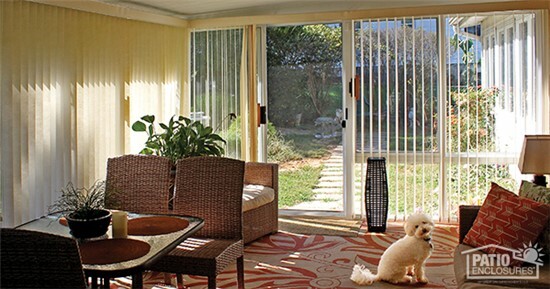 Year round sunrooms and solariums are equipped with double paned, insulated glass and when used in conjunction with a dedicated or zoned heating and cooling system, can make the room available for use every day of the year. Beware of sunroom suppliers that purchase standard sized components such as doors and windows from other manufacturers and then use filler pieces to fit and cover gaps to provide you with a "custom" sunroom. This approach can lead to poor aesthetics and a look that doesn't match the rest of your house. A truly custom sunroom or solarium, by definition, is manufactured for a specific customer taking many factors into account including existing house construction, customer taste, intended use and available space. Look for a company that maintains an engineering staff and its own manufacturing operation. This provides the flexiblity to employ custom manufacturing. Custom manufacturing means that all walls and windows are built to the customer's specifications. Another point to consider is whether the sunroom company's products have been tested to meet local wind, rain and snow load requirements as well as local building codes. It is also a good idea to find out whether the company tests and can provide data on its building materials. A company's warranty is only as good as the company itself. Make sure the company has been in business for a number of years or more. Even a lengthy warranty can be short on protection so make sure you know what is covered and what is not. For example, most warranties cover manufacturer's defects but may not cover failure from ordinary use or weather exposure. Optimally, the company you purchase your room from is the same company that will manufacture and install it. Competent sunroom installers undergo extensive training to help ensure that the your room is built to the utmost standards. An improperly installed sunroom may lead to issues between the customer, contractor and manufacturer. You may wind up stuck with serious problems including a potentially voided warranty. If a company says that they can start your project right away, that may actually be a warning sign since it signals that its business may be on the decline. A company that has a healthy backlog of a few weeks is a sign that it is busy and customers desire their products and are willing to wait. Low-emissive (Low-E) tempered glass offers safety and better insulation than regular glass panels. This glass option promotes safety and can help lower the energy costs associated with heating and cooling your sunroom or solarium. Due to new glass technologies that cut down on harmful UVA and UVB radiation and the fact that many leading furniture manufacturers now use fade-resistant fabrics, you now have more decorating and furnishing options for your sunroom as well. Although there has been improvements in glass technologies, try to work with a sunroom company that also offers custom blinds and shades that were made specifically for use in a sunroom. Shades and blinds are desirable if your sunroom will be exposed to direct sunlight or if you desire more privacy. The obvious, immediate value that sunrooms offer is that they provide a place to relax and add living space to your home. It is important to remember that sunrooms and solariums are also a sound investment. A well built sunroom will typically return more than 70% of your investment at resale. If you live in the Midwest, this number can be as much as 98%. If you are interested in adding a sunroom to your home, schedule a free, no obligation in home estimate with Patio Enclosures. One of our design consultants would be happy to help you plan and design a sunroom to match your home, lifestyle and budget.